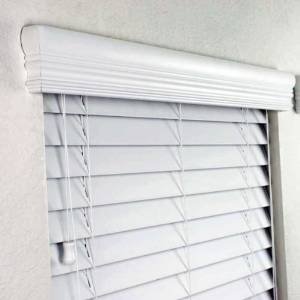 Faux Wood Blinds provide the best solution for window covering in those high-humidity areas like beach houses, gyms, warehouses, kitchens, washrooms and bathrooms. Faux wood blinds or fake wood provide an economical compromise for those with budget constraints as they lend practically the same warm and aesthetic values of real wood blinds. Infinitely durable and finished to repel dust and prevent yellowing due to over-exposure to the sun, they are an excellent choice for use in climates that swing in extremes as they are warp, crack and rot-resistant. They are available in pleasing neutral tones and wood stain colors that allow them to blend into any decor scheme.